Marketing your women’s service line involves more than just talking to women about your obstetrics services. Women are the family healthcare gatekeeper—attract them to your women’s service line and you will attract their family and friends to your other service lines as well. Chapter 2: Women’s Marketing: Is It Really Different From Any Other Service? Disease/Event-Based Marketing? Or Population/Relationship-Based Marketing? What Is the Life Stage Approach? Can Anyone Market Women’s Services? Wait! What If I Really Don’t Have a Marketing Team? Market Research … or MarketING Research? Quantitative or Qualitative Marketing Research? How Involved Should You Be in Marketing Research? Marketing Children’s Services: Is There a Crossover With Women’s Marketing? Mary Anne L. Graf, BSN, MS, currently has full-time responsibility for business development and marketing for women’s and children’s services for the seven-hospital Bon Secours Virginia Health System, the largest faith-based integrated delivery system in Virginia. Prior to joining Bon Secours as vice president for women’s and children’s services in 2001, Graf founded Health Care Innovations and HCI Market Research Group. In the 16 years HCI was Graf’s full-time business, she led the firm to international prominence in women’s and children’s services planning and development. 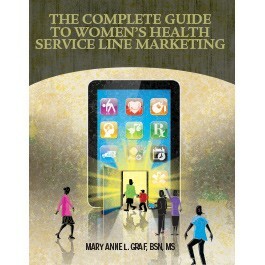 Graf is the author of Women’s Health: Strategies for Superior Service Line Performance (HealthLeaders Media, 2010).